Narrow border matches the number color. Cast in rust-free aluminum with tough all-weather powder-coat finishes. Dimensions: 12" x 7.25" x 0.25". 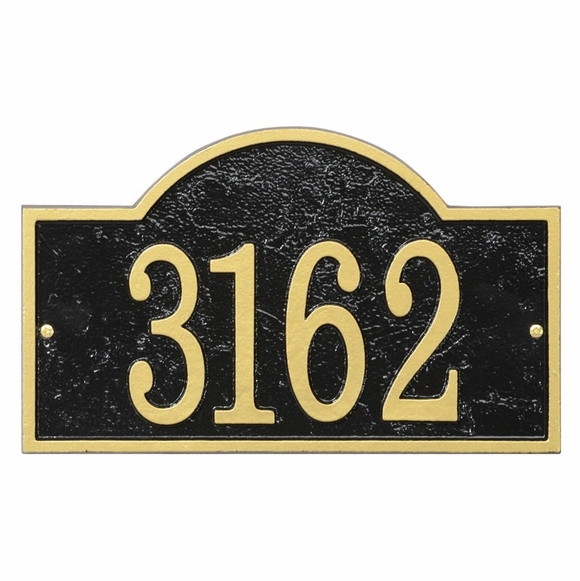 The affordable arch shape personalized house number sign with big 4" numbers. The address plaque is exactly what I hoped for. It was easy to install on my vinyl siding. The plaque came with screws, but I needed an additional half inch in length so I provided my own. Before I made my selection, I mocked up a paper plaque to estimate size and placement. I would recommend the address plaque.